Can somebody say Ewwww Gross!. OMG! 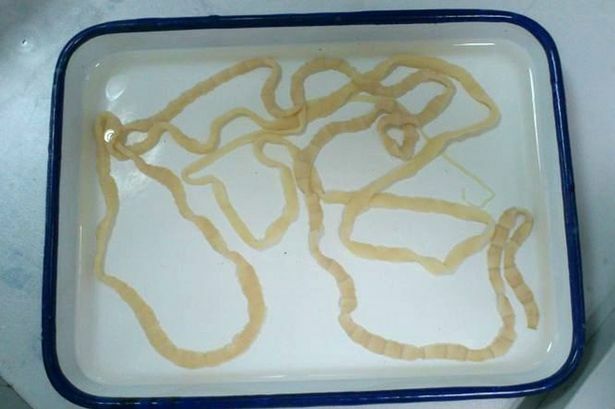 An 8ft tapeworm was removed from woman’s stomach after she ate undercooked contaminated beef somewhere in South East Asia. The lady identified as Mrs Li, after noticing unusual fluids in her stool, went to see a doctor in Xiamen, China. She was diagnosed with teniasis, which pretty much means she had an intestinal tapeworm infection. How does the tapeworm get in the beef you ask? Well the parasite can lay its eggs in animal cysts and if not properly cooked, after a human being eats it, the eggs can hatch and grow in the human gut. OMG Gross! Gross! Gross. Yuck!. Mrs Li was treated with traditional Chinese medicine and was able to pass the worm out you see above. #Faints. This kind of story just makes me wanna pukesieees! Prev Sugar Daddy University – Would you attend? what is this? how is this possible? She is lucky she went to the doctor on time. This thing could have killed her. How did it grow so big? What in the world is that, is that even safe to be in your body? LMAO Yaz.. we just had this argument yesterday. Someone argued that he is still coming back. lmao!. sure he is..